Imagine you have just bought a brand-new smartphone and just a few days later you spill an entire mug of coffee over it, or drop it in the sink. Generally, you’d have to beg your manufacturer’s support staff to have it replaced, but now there is a much easier and convenient option to make sure this never happens in the first place: Liquipel 2.0. By simply sending in your device, an invisible coating will be sprayed over your device in order to make it resistant to most wear and tear, including water damage. This coating is permanent, invisible and allegedly quite reliable: indeed, it requires no intervention from you, ever. Below you can see a white iPhone being submerged in water and still being fully functional afterwards. This invisible, untraceable and ever-lasting coating works with any smartphone or tablet. 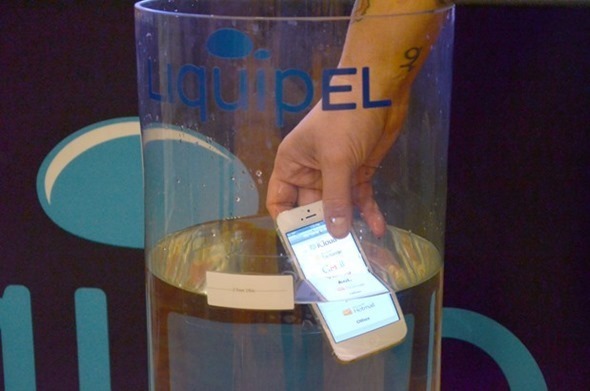 Unlike last year’s version, however, Liquipel 2.0 has been developed for the mass market: instead of applying the casing itself, the company is allowing third-parties to purchase a kit that will make it easier for those with little skill to apply this themselves. While the everyday smartphone and tablet user probably won’t need such a kit, unless they happen to be owners and regular purchases of devices, Liquipel’s envisions that everyday shoppers will simply be able to walk into any electronics shop and have the casing applied for them, on the spot. I will sure be looking forward to applying this casing to my own device. Finally, it will be easy to check my emails while relaxing in my swimming pool, confident that this invisible waterproof casing will not turn my holiday into a day to forget.